Before talking about my holiday, I would like to answer the following questions of “Travel Baton” that I received from Ms. Cheery Sheep. 1. The best domestic destination I have ever been. 2. The best foreign destination I have ever been. 3. The domestic destination I would like to go in future. 4. The foreign destination I would like to go in future. 5. The person you pass the baton. A packaged tour to Mount Fuji where I went with my husband. It was a series of culture shock for him. For example, we were called out our names every hour by our guide dudes. We got rained and soaked wet. We arrived at our accommodation at last, but a fireplace did have no fire to dry our clothes. We had to lie down like sardines in a can. I had my husband on one side and a stranger on the other side. Breakfast was vacuum packed rice and heated up rice packs were distributed on that night. Next day the weather was bad and gave up to go to the top and climbed down. On the way home, it was great to have a bath in a hot spring near Lake Kawaguchi and to have white peach ice cream. I think this was the worst trip but it’s fun memory now. But I am not gonna stay at that accommodation next time I go! We had a canal boat trip to Llangollan in Wales, UK for our honeymoon. About 200 years ago during the Industrial Revolution in Britain, many canals were built as means of transportation (Click here for the map of canals). Nowadays, canals which width is about 5 meters wide are used for narrow boats. 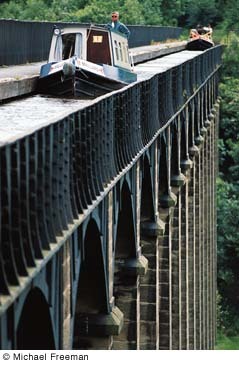 Narrow boats are facilitated with a kitchen, shower, toilet, beds and so on. We got on this movable house which speed is about the same as fast walking and we headed to Llangollan. When the sun set we anchored our boat and we cooked and had dinner in the boat, or sometimes we went to a local restaurant. Of course, we went to local pubs every night. 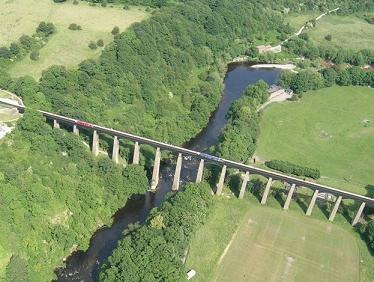 The climax of our trip was Pontcysyllte bridge. This bridge is only for pedestrians and boats and its height is about 35 meters. On the way to Llangollan, my husband operated the boat and I walked the sidewalk for pedestrians and I made fun of my husband who was dead-seriously driving. On the way back, it was my turn to operate the boat. Looking at me almost fainting during driving, my husband didn’t loose an opportunity to revenge on me: He rocked the boat. Thanks honey! The narrow boat trip was so much fun. I would love to do it again definitely. Coincidently I found this travel journal of a Japanese family who went to Llangollan using the same boat rental company. I was so thrilled to find that they traveled exactly the same place. Climbing up Mount Fuji again and going to Yaku island. I took an airplane there with my sister but due to bad weather, it only went to Kazoshima and we had to return home. Shame. I heard that the nature in Yaku island is wonderful. Auschwitz concentration camp in Polland. Ms. Mapleleaf92：Please tell me about your trip to Zermatt in Switzerland and to Venezia in Italy. Mr. 405X：You say you want to go travelling but tell me where you want to go.